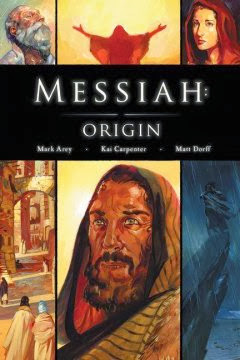 Messiah: Origin is a 2013 graphic novel by Mark Arey, Kai Carpenter, and Matt Dorff. It covers the biblical narrative from the annunciation of the nativity of John the Baptist through the beginning of John’s ministry. This isn’t a comic book in the conventional sense; the panels are sequential, but all the text is adapted straight from the New Testament (specifically, from John 1, Luke 1–2, Matthew 1–3, and Mark 1). As such, it often feels more like an art book. This is further compounded by the fact that, as Dorff acknowledges, the layouts borrow heavily (read: copy) from various iconic painters and filmmakers. The unequivocal highlight of Messiah: Origin is Kai Carpenter’s outstanding art. His faces and expressions are fantastic, which is essential given the more static nature of the storytelling here. His use of light and color are also excellent, and the end product is often captivating. If you’re looking for a comic book version of the Christmas story, Messiah: Origin really isn’t it, but it is a great looking and worthwhile piece of work.